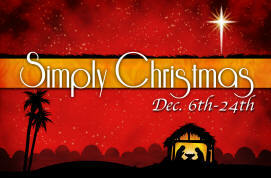 These are some of the notes I will use for tomorrow’s message – part 3 of Simply Christmas at Maranatha Church. Getting stoked about Christmas this time of year is one thing, but being impacted by Christmas all year long – now that’s difficult to attain! The message of Christmas is so huge, it simply has to make a difference in our lives every day! How do we keep Christmas beyond the few weeks surrounding the holiday? The prophet was giving a hint as to what lies ahead for Jesus. And it did not sound very promising, did it? There is a declaration, made by angels, that identified Jesus with a particular title, with a responsibility. A name that is given to no one else. Greek scholars use the word “sozo” (sode’-zo); to Deliverer. One who saves, protects, or makes whole. “Redeem”: to buy up, ransom; to rescue from loss. Where would all of this saving and redemption happen? It would not happen while Jesus was a baby in the manger. It would happen 33 years later. What is the most appropriate symbol of Christmas? I believe the greatest symbol of Christmas is the Cross. The cross is vital to the story of the Gospel. God sent his Son Jesus, born of a virgin. He lived and loved and changed the world. He died a gruesome death on the cross. Jesus resurrected on the third day and came out of His grave. Jesus is alive forever and now sits enthroned in heaven. Jesus will one day come again to take His followers to be with Him in heaven. Cling to the eternal symbol of Christmas – the cross of Jesus Christ. You will then be able to keep Christmas every day of your life.